"Top Tips" is a brand new series from Scripture Union. If you've got a children's group, then get 'top tips' from the experts - "Top Tips" are booklets designed for busy children's workers. They're big on practical advice, but small enough to digest over a cup of coffee or two so you can get to grips with the issues fast. It is accessible and practical and is written by experts. 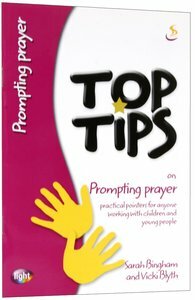 About "Prompting Prayer (Top Tips Series)"